If you want to use your stash and/or scrap fabric and perfect a faster way of making half square triangles, I have a new pattern coming out (OLD MOHAWK QUILT PATTERN) on Tuesday, March 27, 2018! 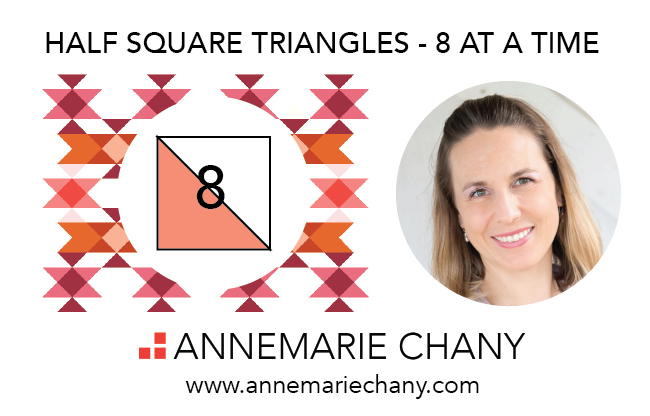 I have created a new video tutorial to supplement the pattern to help you in making 8 Half Square Triangle quilt blocks at a time. Talk about a time saver! You can check it out here and get a peek at the new pattern! Where does your quilting inspiration come from? There are so many wonderful places to draw creativity from. We can pull from our experiences, travels, nature and our daily life. With so much information on the internet, we are never short of seeing inspiration from others via blogs, instagram, other photo sharing sites, and Pinterest. But where does the inspiration begin? A photo? A color? A quilt block? The answer may change with each project. I enjoy finding inspiration at color palette websites. Have you tried it? 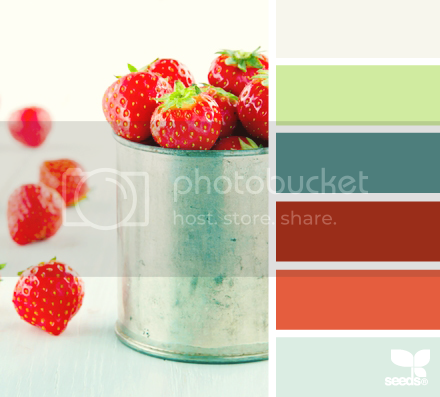 Color palette websites are based on gorgeous photography. The photos are shown with the major corresponding colors pulled out of the photo and listed next to each other in a paint chip-like swatch. I love to peruse palette websites, looking for a series of colors that Wow me and would look good in my next quilt. Using a Color Palette Image to Inspire Fabric Choices: Here is an example of how I used a color palette image in a quilt. This Vice Versa quilt was originally designed using greens, yellows and blues. The palette was harsh, but it helped me decide what quilt blocks I wanted to include in the Sampler. After the blocks and layout were decided, I was in need of some color inspiration. I turned to Design Seeds to find the right palette for this quilt. On the left, is the Color Sip image from Design Seeds. I mocked up the quilt using this soft palette of putty, dreamsicle orange, coral, plum and green apple. I liked this look and was able to choose a similar palette of solids to make the actual quilt. Using a Color Palette Image to Inspire Fabric Choices AND Quilt Design: This color palette image influenced both the quilt design and the color inspiration. I found this Pigmented Palette image again at Design Seeds. The image evokes a strong southwest feel for me. I kept picturing a quilted version of a totem pole in my head. I wanted to use a quilt block that could represent that notion to form the layout for the quilt. This quilt, Moccasin, is based on the X&+ and Sister's Choice quilt blocks. The individual sampler blocks fill the totem pole. The color palette pulled from the image spoke strongly to me, but I decided to change the blue hue from aqua to midnight blue. This makes me think the quilt shows itself against the night sky. Create your own palette: Say you have your own photo that inspires you. It would make a perfect color palette if only you knew how to do it. No problem! Check out Chip It from Sherwin-Williams. You can instantly turn your photo into a color palette using over 1,500 of Sherwin-Williams paint colors. Pretty clever, huh? 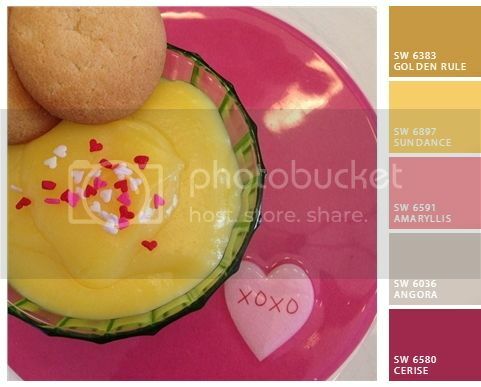 Here's a photo from my Instagram feed of Valentine's day pudding that I tested out with Chip It. Wouldn't that make a pretty quilt? I hope you find some inspiration here and check out some of the color palette sites next time you sit down to make your next quilt. Hello there! Today I am sharing my best quick quilting tip with you as a part of Amy Smart / Diary of a Quilter's Quick Quilting Tips and Tricks blog hop to celebrate her new book Fabulously Fast Quilts . Hopefully this tip will help you see a little less of Mr. Seam Ripper. In the 8 years I've been sewing, I can honestly say there is ONE thing I did that dramatically changed my piecing. For many years, I pieced and pieced always to end up with blocks that were a little off. Sound familiar? I'd heard of a scant 1/4" seam and didn't really pay much attention - thinking I was using a foot that was supposed to be 1/4". But what does the scant mean? The term scant means just a thread shy of a 1/4". If you never test for it, you don't realize that your thread and the pressed fold take up some space in the measurement, usually resulting in blocks being short of their required finished dimensions. The idea is to sew with a seam allowance a little bit smaller than 1/4" - then press open your pieced unit open. 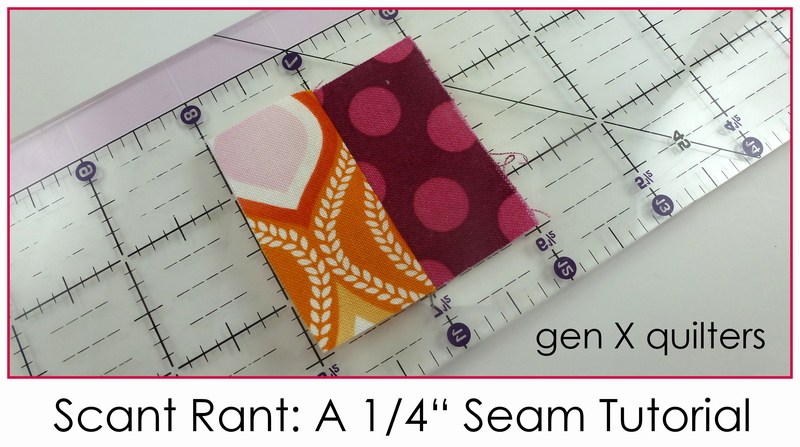 We want <1/4" seam + thread diameter + fold to yield a pieced block that is right on the money. There is a simple test you can do by sewing only 2 rectangles together to see if the seam allowance you are sewing with yields the desired measurement. For basic sewing machines (Machines with Fixed Needles) - find the test instructions here. For sewing machines with adjustable needle positions - find the test instructions here. 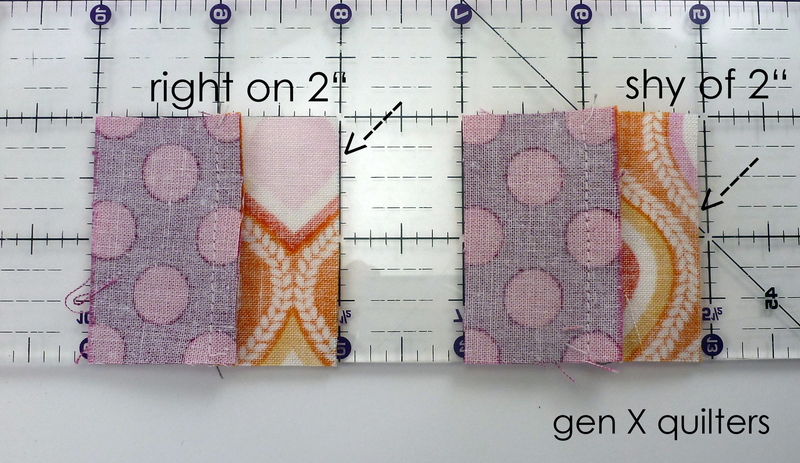 I also explored how the seam allowance is affected by pressing method here if you want to get crazy with it. My suggestion is to perform this test for the way you usually sew - and then watch your blocks come together more accurately. I hope this helps some of you avoid some headaches in the future!